Grown since antiquity for its tart fruit, sour cherry is a small deciduous tree known only in cultivation. It probably originated in eastern Europe or western Asia from a hybrid between sweet cherry, Prunus avium, and ground cherry, Prunus fruticosa. The shiny, dark green, oval leaves of this hardy tree have toothed edges and a pointed tip. They flush in early to mid-spring, just as the abundant cupped, white, five-petaled flowers open. Spherical, long-stemmed fruits follow the flowers, ripening in late spring or early summer. 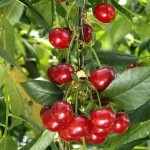 Trees are self-fertile, fruiting without cross-pollination. For optimal production they require 1000 to 1500 hours per winter of temperatures of a few degrees above freezing. 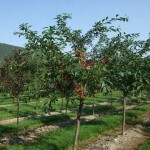 This small, round-headed tree has spreading, dark-barked limbs, and often suckers liberally when planted on its own roots. 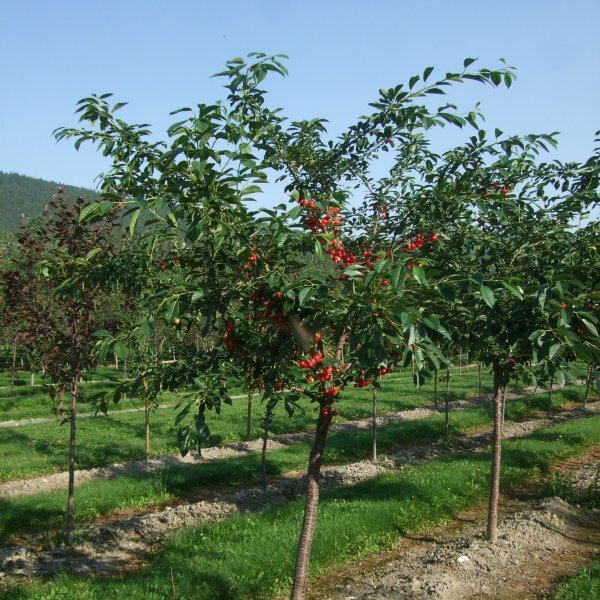 Trees are usually propagated by grafting onto Prunus mahaleb understock.